On the one hand, farmers have time to prepare. We fill feed bins and fuel tanks, bring in mattresses for staff and tie down equipment. On the other hand it gives us a lot of time to worry. We watched Hurricane Florence head toward us for a week before she arrived. The hurricane was tough, it parked over Eastern North Carolina dumping up to 40 inches of rain. But the real challenge came after, when the rivers flooded. My house and my farm are separated by a river. During and after the hurricane my husband lived on the farm with the animals. He was fortunate that neighbors on that side of the river fed him and checked on him. I was stranded miles from our home and relied on the kindness of neighbors to keep me updated on our house and let me know when water has receded enough for me to make my way back. It sounds like a small thing, but in the face of a disaster it was huge to know that our friends and neighbors were on our side. Neighbors, friends, they were there for us when we needed help. While we have recovered, the same cannot be said of everyone in Florence’s path. Many lost homes, cars, jobs, and sadly, even family members. 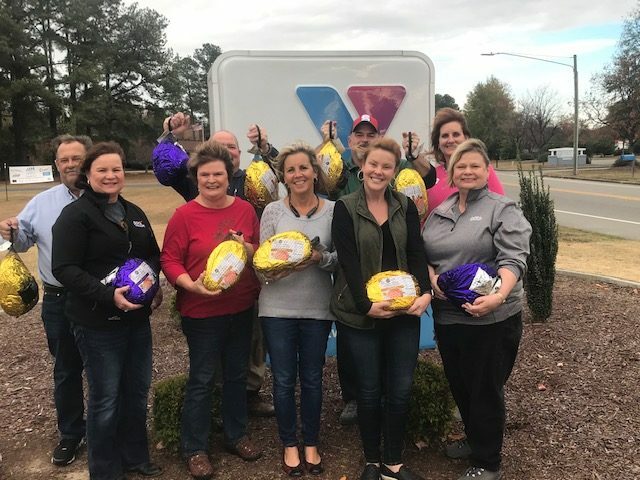 Pig farmers from Wayne County in Eastern North Carolina have banded together with the Goldsboro Family YMCA to donate hams and turkeys to families who were affected by the storm. The Family Y, through their Y’s Men program are supporting 80 families who were negatively impacted by Hurricane Florence. We know what it feels like and want to pay forward the kindness that was paid to us, so we are providing hams and turkeys for the families in this program. That’s what neighbors do. Help each other. Support each other. And have each other backs. Giving a ham to a family that’s struggling is a small thing, but sometimes those small things mean the most.